The idea for this crochet sweater has been rolling around my brain for the past 6 months and at long last it’s finally ready to come out! I think it must’ve been the buttons – they finally got my hook moving. Or maybe it was waiting for fall… Whatever happened, I’m so glad it did! The Eloise Baby Sweater is the result – and I think it was worth the wait! Baby sweaters are usually made in sweet pastels, but there was something about the jewel tones of this wool that caught my eye. It reminds me of the stories of Eloise, and her mischievous but ever lovely ways. I think she would have looked rawther fetching wearing this as a baby. Peeking out from the warm gray, each color really pops. As Eloise would say, it’s absolutely brilliant. That’s not a weird thing to say about a sweater, right? So on to the pattern! The Eloise Baby Sweater is available in five sizes: 0-6 months, 6-12 months, 18 months, 2T, and 3T. To make it easy, use the green Print Friendly button to print out a personal copy, and then circle or highlight the numbers for the size you’re making. If you prefer not to use the Chainless Starting Double Crochet (tutorial linked below), then ch 2 and dc in the first st of each round where applicable. Sizes in the pattern are written as 6mths(12mths, 18mths, 2T, 3T) – when only one number is shown it applies to all sizes. Looking for larger sizes? Check out the Eloise Girls Sweater! Starting with the skirt, which is worked sideways. Row 1: With Color A, FDC 27(29, 31, 33, 35). Turn. Row 11 – 54(58, 62, 66, 70): Repeat Rows 7 – 10, alternating between colors B through E for the Row 7-8 repeats. Do not break Color A. NOTE: For 6mths there will be 13 color stripes, for 12mths there will be 14 color stripes, for 18mths there will be 15 color stripes, for 2T there will be 16 color stripes, and for 3T there will be 17 color stripes. 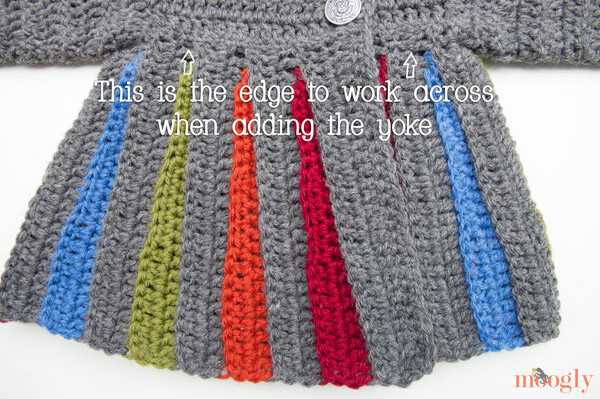 Moving to the yoke: turn the skirt 90° so that you are crocheting across the all-Color A, or shorter edge of the skirt – this side becomes the top of the skirt. The WS is facing you. NOTE: If the neckline seems to large here for the larger sizes, turn and work another row of sc sts, following the decreasing pattern established. 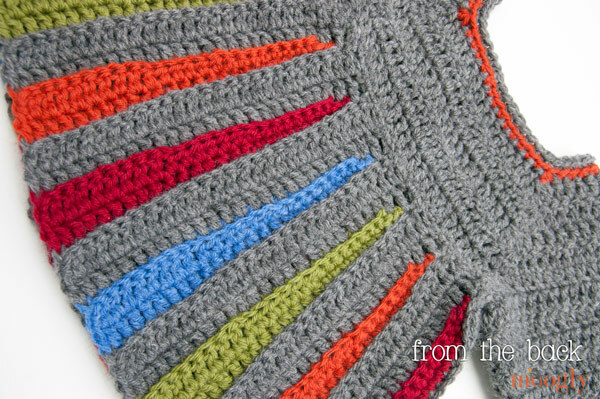 Make the sleeves: Sleeves are crocheted right onto the yoke. Though they are crocheted in the round, after the join at the end of each round, you’ll turn – so that even numbered rows will be worked from the “inside” of the sleeve. SIZE 3T ONLY: CSDC, dc in next st and each st around. Turn. (34 sts) Then proceed as written. Round 3 – 11: Repeat Round 2, decreasing 1 st per round, so that at the end of Round 11 you’ll have 22(22, 24, 24, 24) sts. For size 0-6 mths: Break yarn and go to Cuff Instructions below. For size 6-12 mths, 18 mths, 2T and 3T: go to Round 12 below. 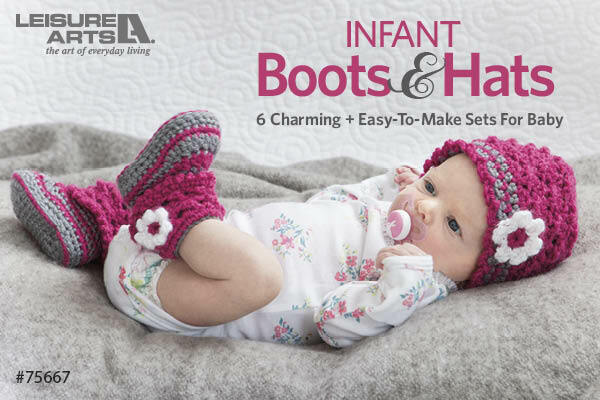 For size 6-12 mths: Repeat Round 12 1x. Break yarn, go to Cuff Instructions below. For size 18 mths: Repeat Round 12 2x. Break yarn, go to Cuff Instructions below. For sizes 2T and 3T: Repeat Round 12 3x. Break yarn, go to Cuff Instructions below. Round 1: With Color B, from RS of sleeve, join to BLO of joining st of previous row with a sl st. Ch 1, sc in BLO of each st around. (22(22, 24, 24, 24 sts) Break yarn, seamless join in 2nd st of the round. Round 4: With Color E, repeat previous round. (22(22, 24, 24, 24 sts) Weave in ends. Edge the front opening and neckline. With Color A, join to RS front opening at the bottom of the skirt with a sl st. Sc evenly up the side, sc in the BLO around the neck opening, and sc down the other side, leaving the bottom of the skirt un-edged. Sew buttons to sweater so that they fit between dc sts of the yoke, as shown. As opposed to fixed button holes, this will allow for a more adjustable fit! What do you think? Absolutely charming for any little princess at the Plaza – or wherever you spend the holidays! I hope you enjoy the Eloise Baby Sweater! Let me know if you spot any errors, as you’re my pattern testers. Enjoy! Oh my goodness. This is absolutely gorgeous! I love the colors. But mostly I love the design. Just beautiful. This sweater was awesome, and I found it very easy to follow and got it done really quick. I plan on doing more and in different colors. I would post a photo of the one I did, but I don’t know how to do that. I’m glad you enjoyed the pattern Kandace! You’re welcome to share a picture on the wall of the Moogly facebook page if you like! I love the Eloise sweater, loved making it, but there is something I didn’t understand. When you work the pleat and go back to color A loop , how do you not have a strand of yarn across the bottom of the pkeat color? I wish I could poat a picture to show you. My sweater turned out beautiful, I just wish the bottom looked like yours and didn’t have a continuation from color A loop across the pleat colors. ( does this make sense? Hi Donna! Thank you! The main color wouldn’t have a strand going across because it’s continued at the top of the color inserts, above them, not below. I’m a little confused by what you’re describing! Thank you for you response. I usually do not have a problem following a written pattern, but somehow I am totally off on the pattern because I stopped the A color and pulled the loop at the bottom (hem) of the sweater. I improvised, but plan on making another one and wanr to get it right. This is way too cute!! I think I’ll try it first with just two colors. And it’s the perfect time of year to start working on winter clothes again. A beautiful design, thank you for posting this! Love it! Your colors are fantastic, but so many possibilities, too. You’re my hero! This is just really eye-catching! 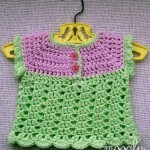 I am going to try to make this for my granddaughter, who is 3 1/2, so I will have to enlarge it to fit her. I think the pattern is simple enough I can do that. Love it!! So how do I make it to fit my 2 year old? This is just adorable. So nice to see something in todays colors. I can hardly wait to try it, it’s fascinating. Already thinking about a dress just like it:) Thank you. how many chains to start with? don’t you have to start out with chaining? Row 1: With Color A, FDC 27(29). Turn. FDC is Foundation Double Crochet – it’s an alternative to chaining, and there’s a video tutorial linked in the pattern notes. If you prefer to start with a chain, you’ll want to ch 29(31), and dc in the 4th chain from the hook and each ch to the end, so that you have a st count of 27(29) for the first row. I wish this had toddler sizes as well. My 3 yo would look adorable in this!! Yay! My 27mth old sweet pea would look so good in this sweater. I look forward to the upsizes, my daughter is 2 1/2 and would look super cute in this and would love it as well. I look forward to the upsizes, my daughter would look super cute in this and would love it as well. This is truly the most beautiful sweater I’ve seen for littles in a very long time!!! I was just thinking about getting a couple more made for my two littles, but they’re both size 4T and 5T. Is there any way to adjust the current pattern? I’m thinking this is so wonderful, I might just go ahead and try upsizing by adding extra chains, using a larger hook even though it’s already in a J. We’ll see. If it doesn’t work for own little ones, I’ll have a lovely gift ready to give to another lucky girl. 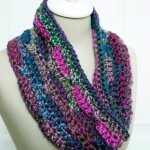 Truly gorgeous and thank you so much for generously sharing the pattern. Also, I don’t have a blog up yet, so I linked to my Pinterest boards. This is cute enough that I want to make it for myself! So any chance you’re working on an adult pattern? That is such a cute, happy little sweater … love it! 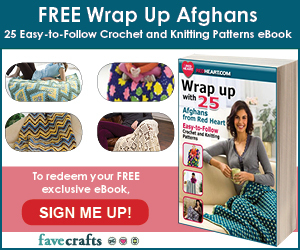 Thank you so very much for this beautiful free pattern & the chance to win the yarn to make it! 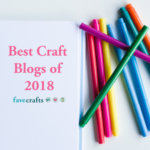 I love all of your blog posts and follow them every time you post. I love to put your links on my Pinterest and follow you there also.. Blessings.. I am in love with this sweater. Thank you for the pattern. I have run across a snag. I’m doing the bigger size. In Row 3, you start off with 29 sts from Row 2. You miss the 1st st, sl st in 2 sts, sc in 7 sts, hdc in 9 sts, dc in 9 sts, That makes 28 sts. You say we are to have 27 sts. How? Also if you start with 29 sts from Row 2 and end up with 27 st in Row 3 you need to miss another st somewhere. 2+7+9+9 does add up to 27, but there is an error – it should read 3rd st of the row. I’ll fix it now! Thanks for letting me know! It might! Using a slightly thicker yarn would help too. I’ll be working on upsizing it, but the basics are that you’ll need to make the rows of the skirt longer, make more of them until they’re big enough to go around the chest, then start the yoke, doing some math on where to do the decreases. I love this sweater, but I only knit. How hard is this for a first time crocheter? (I know how to do basic chain stitch, but that’s about it, but I’m a great knitter. 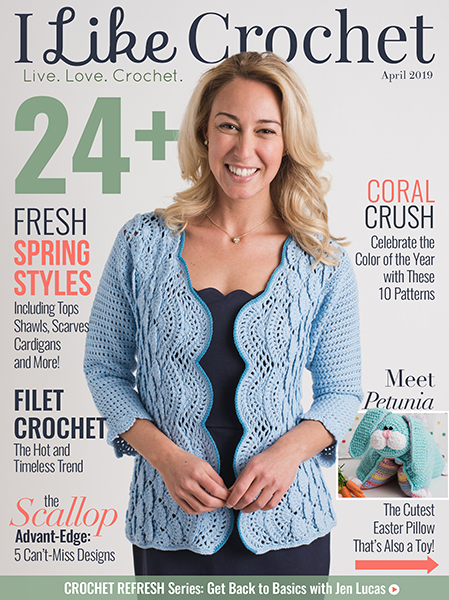 Shoot, wouldn’t you know the one I love is for crocheting? [g] Or I could take the idea and convert it to knitting. I need to think about this quandary…..
I’m not sure I’d tackle it for a first project. Translating it to knit is an idea though! I might have to tackle it in the future. This pattern has inspired a lot of different requests! I adore this too, but am only a knitter. My fingers are crossed that you’ll one day translate it to a knitting pattern! I totally agree with some other posters I would love to make this for myself maybe in two colors, I am thinking either the grey with black accents or maybe navy with cream. Any help you can give me for upsizing it or please consider doing a pattern for adults too. I think for adults I’ll want to write it up as a customizable “recipe” – since everyone is shaped differently. SO much easier for kids lol. I’m definitely rolling some ideas around in my brain though! What an adorable sweater! We have several friends who have newborns or are expecting. At least one of them will get this as a gift! such a lovely jacket. I started making this morning and only have the sleeves left to finish. however I noticed an error in row 6 of the yoke. line 3 should be: dc in the next 12sts(not 14). apart from that it is a very easy pattern to follow and I enjoyed making it. Will put it on Ravelry once I finish. thanks for sharing it. OMG this is absolutely stunning. This is one of your best. Picking up the loop literally means just stick your hook back in the loop that you’d abandoned earlier to make the color insert. So you’ll work 2 sts in the main color, then work sts all along the color insert – that should add up to total number of sts for the row. Does that help? I am also confused! I understand picking up the loop but I’m just not sure where to work my stitches for this row. I picked up the loop at row 2 so should I be working across the back loops of row 2 (the main colour) or am I somehow supposed to be working in the last row made (row 4 in colour B)? Hi Ali! You start out working into Row 2, but then when you come to the Row 4 sts you work into those. Does that help? This link does not work. See the other one below. Sorry! I commented on the FB post too – it’s gorgeous! Love it Mary! Finished my first one. Now on to the second. Super cute! I love this design. Thank you for your comment on being a lefty. I fell in love with this sweater the first time I saw it. I even purchased the yarn. I realized I would have to make it backwards and have been a little intimidated by that thought. Your message has given me the courage to start! Thanks to Tamara for this beautiful cardigan. I love the colors and the style. I love this pattern so much! Hi Tamara, I love this little sweater! I just had one quick question, how do I slip stitch twice in one stitch? or maybe I’m reading this part of the pattern wrong? With Color B, join to BLO of 3rd st of previous row with a sl st. Working in BLO, sl st in the same st and next st…….I’ve kind of finagled it so far so that I chain one after the initial slip stitch and then do another slip stitch and it doesn’t look bad, I’m just not sure I’m using the right technique. Any help would be appreciated, thanks! Ah I can see how that’s confusing! The first sl st in the 3rd is the joining of the new color, and it tends to be very tight, right down on the yarn. The second sl st is more horizontal, working along the row like other sts. You don’t need to ch 1 in between, but if you like the looks it gives you you certainly may! Adorable!!!! I can’t wait to make this!! Yay! I’m so glad it worked for you Melissa! I can’t see the photo from that link, unfortunately, but I’m sure it’s lovely! That’s strange. It works when I click it. This is an adorable sweater!!! I appreciate you posted the pattern for free. I absolutely fell in love with it and I am currently working on a 2T size for my daughter. I already finished the “skirt” but I am having problems with the yoke. I just don’t understand what it means in row 2 where it says “skip” 5, chain 22… I don’t get how I skip these 5, perhaps with a slip stitch??. I also thought of chaining 22 and then skip 5 and continue with the double crochet… I am all stuck in this part! Could you help me please??? Thank you!! The last guess is the right one. Chain 22, skip over the next 5 sts, and just resume the dc in the 6th st. Is that clearer? Yes!! thanks so much for your prompt reply! Was browsing on Ravelry.com and saw this pattern. I knew had to make it for 3 reasons. First my Moms name is Eloise. Second just love the Eloise movies. And third I know a darling little one who will look adorable in this sweater. The pattern was well written and easy to follow, Many thanks. Thank you Granny Linda! You’re very welcome! I’m in the process of making this lovely sweater. However, I am now working on the yoke and I am confused by row 2 where it says to ch 22 (for 2T). I’m stuck at that point because I’m not sure what to do. If you could please email me I would appreciate it. Thank you. Ch 22 means to chain 22. What you’re doing here is creating the part of the yoke that will go up over the shoulder. The next 5 sts of the previous row are skipped, and they become the armpit. Then you resume dc sts in the 6th st. I’ll send this to you in an email as well! I am sorry.. I am at the same spot.. finished the skirt, but have NO idea what you mean about skipping 5 stitches.. could you explain a bit clearer for me please ?? I am loving making this for my grand daughter. !!! Could you send me more specifics or a picture PLEASE !!! What you’re doing here is making the armholes – while the video above is working top down, and here you’re going bottom up, the idea is the same… just worked in reverse. Does that help at all? Yes the video is clear.. but if I SKIP 5 stiches then the wool just hangs so do I slip stitch ? Then what do I do with the chain ? Sorry to be so confused, but when I follow your patter, I end up with a 5 stitch space and then a 22 chain that goes nowhere.. I must be not understanding something ??? Ok, you have the ch of 20, and you’ve skipped over the 5 sts (do NOT slip stitch in them), so you then re-start crocheting in the 6th stitch – the one just past the 5 you skipped. The ch 20 becomes the shoulder, and the 5 you skipped become the armpit. Is that clearer? THANK YOU THANK YOU I got it !11 I just LOVE this pattern.. so much fun to make.. and so excited to give it to my granddaughter.. I absolutely love this little sweater! I finished the skirt part and I have run into some problems and needs some help. In Row 3 of the yolk, after the dc3tog you have dc in the next 18. I’m confused, b/c where I’m at is at the chained 20 stitches from the row before. Am I supposed to skip some stitches somewhere? Please help! Chainless Starting Double Crochet (or ch 2 and dc) in the first st, dc in the next 8 sts, then dc3tog (into the last two sts before the chain and the first chain). Then, work 18 dc into the next 18 ch. This leaves 1 ch unworked, so the next dc3tog is into that last ch and the next 2 dc sts. Then dc in the next 21 sts (the back o the sweater), then the next dc3tog (into the last 2 dc of that section plus 1 ch st), then 18 dc in the next 18 ch sts, then dc3tog in the last ch st and the next 2 dc sts, then dc in the remaining dc sts. Ah, ok! 😀 Glad we got that sorted. I love everything about it!! It’s on my list. I’m working on the 18 month size and I’ve been getting 9 DC on the rows with the change of color instead of the 10 DC that you wrote out. Hope that makes sense. Ha! No idea either! That helps though, thanks! what is an approximate length of 3T? PRECIOUS pattern! I made it in dark purple with white, pink, baby blue, and lavender stripes and pearl buttons. I can’t wait to wrap up my baby girl in it! Thank you so much! Hi, I’m just a bit confused with the 13 colour stripes. Is it just the colours and not the main colour that is counted? It would help if their were measurements included. How long the skirt part is, how wide or the measure around the chest, length of sleeves, size of arm and neck opening….. Thanks Tamara, very helpful size charts! There are 4 dc3tog sts in each row – they create the 4 corners of the yoke. In Row 4 you dc (or csdc) in the first 15 sts, then work the first dc3tog – this will be worked over the front section, the last dc3tog of the previous row, and one st from the shoulder section. Then you dc in the next 16 sts. Then the next dc3tog will be worked over the last st of the shoulder section, the second to last dc3tog of the previous row, and the first st of the back section. So with each Row of the yoke the sleeve portions and back portion will lose 2 sts each, and the front sections will lose 1 st each – 4 dc3tog sts reduce each row by 8 sts. Does that help? 😀 So glad to hear it!! hi i am really struggling with this section as well, Just wondering where to do the dc3tog in the ch20 gap or in the part along… if that makes sense..
Any idea how to lengthen the skirt to make a babydoll waist dress? It would be adorable as a dress, but I’m not sure how to work out the drape with the A-line skirt. Depending on the size you’re making, you could grab the stitch pattern from 2-3 sizes up (and use the row count from the size you’re making). If you’re making one of the larger sizes, just work the first two rows of the skirt (color A) to the length you want the skirt to hang, then subtract 5-8 stitches at the top (for the top of the pleats and the sl sts) and divide the remainder by 3 (1/3 sc, 1/3 hdc, 1/3 dc), adding any remainder to the hdc and dc portions. Oi ! Tudo bem? Achei lindo seus trabalhos, e gostaria de se fosse possível , que vc mandasse o passo a passo em português pois não entendo nada em inglês. Obrigada, Beijos mil e sucesso. Se eu receber uma oferta para uma tradução Português I terá a certeza de adicioná-lo como um pdf! 🙂 Obrigado! I love this sweater!! My daughter is now a 3T, but closer to 4T. I’m waiting with bated breath for 4T sizing! Thank you so much for designing this sweater, It is absolutely gorgeous. Thank you so much! I have pinned it. It’s on my list to make. You are amazing! I love this sweater! Thanks so much for sharing the pattern. I’m done with the skirt, but I’m having problems to get the 76 sc to begin the yolk (size 2). Should I just go back and randomly ad the 9 stitches I’m missing? It looks even to me so far. It’s not easy, it’s true! The best way I found is to use stitch markers to break in into sections and then make sure you get the required number in each section. I’m having so much trouble with row 1 of the yoke on a 3T. There are 17 colored rows so there are 18 rows of color A. Each is 2 rows of dc so that’s 36. Each dc gets 2 single crochets, that’s 72. How do I get to 80? Did I miss something? I love this! I wish I could make one to fit my 8 y/0 granddaughter? How many do we chain in the beginning???? Or did I miss that???? I’m making the 2T size, and I was just wondering about Row 3 of the yoke. When I am crocheting into the chains from the previous row should I be working under both loops just like working into a regular stitch? Or should I just be using the front loop only? I just thought I might be doing wrong since I’ll have two stitch “bottoms” joined together when starting the sleeves which may make it a bulkier row? Definitely can’t tell from your photos though they look great! I hope that makes sense. Thanks for the great pattern! I’m fairly new to crochet but I’m getting along well with this. Hi Jennie! Thanks for your kind words! You should be working under both loops just like a regular stitch. When you join for the sleeve you’ll be working into the unused loops of the chain (and the skipped “armpit” sts) so it shouldn’t be any bulkier. Hope that helps! That does!! I probably would’ve worked in between the stitches or something by accident but that makes sense. Thanks so much! I want to purchase this sweater.This is absolutely gorgeous! I love the colors & design both.. how much it costs? I am trying the 12 mo. size. First time for FDC stitch. Is it ok if it bends to the left or am I making it too tight? Love the pattern. A little bit of lean is fine! If it seems too tight at the “chain” or base of the FDCs, try making that first ch or loop just a bit bigger than the next. I’m off count on yoke tie 3. Count is correct on row 2 if yoke. On yoke row 3, after I crochet the 29 dc-s after the first armhole, I am 2 stitches short in the dec 3 dc together. I run into the 2nd armhole. Im stuck. Do I increase stitches in row below? I don’t know how to fix this, and I’ve torn it out several times. I have the 70 dv and 44 ch on row 2 of yoke. Hi Susan! The dc3tog is worked over 2 sts of the body, and 1 st of the shoulder ch. The previous decrease should’ve used 1 ch and 2 of the body sts. Is that what you’ve got up to that point? I love this pattern! I made my first (in Notre Dame colors) using Caron Simply Soft. Now I’m making one using Loops and Thread (michael’s store brand) Impeccable, which is significantly thicker than the simply soft. Typically, I have to go up a hook size to get the right fit but this time I stayed true to the pattern. I have made the 0-12 month size, 13 color patches, but feel like this sweater is going to be HUGE. Can you give me an estimate if how big the waist should be for this size? I’m looking for either circumference or diameter, either will work. This is for a winter baby, so the smaller the better. Thank you Brianne! The 0-6 mth size should be about 17 inches around at the chest, though a little bit bigger is good too, for layering. The “skirt” of the sweater flairs out from the armpit/chest line so the chest measurement is the one to go by. Are the ch 2 and the cdsc considered the first dc of the row ? The CSDC is considered the first dc of the row, a ch 2 is not. Hi Tamara..I am making the smallest 3-6 months size and its going great so far EXCEPT one thing, Its on the Yoke Section. On which row should I do SC mentioned in row 7 of yoke area where we add accent color ? is it on row 6 or row 5 ? I have tried it on both of rows but its not getting along. the sc3tog of row 7 are not coming on the top of dc3tog of row 6 or 5. Please help sort this out ! Hello Khadija! I’m not sure I understand your question. Row 7 is the sc row, which you should make in the color of your choice. It’s worked after and into the top of Row 6, just as it would be if you continued in the same color. If it’s the row of grey that you see in the photos above of the accent color that confuses you, that’s from the edging worked later. So Row 7 is the final row of the yoke, and will be on top until you work the edging. Does that help? I’m not sure how UK clothing sized work comparatively, but the 3T should fit a chest size of 22inches, while the 4-6 should fit around 24 inches. Hope that helps! I don’t understand what I’m supposed to do after double crocheting in 17. Skip 5, chain 20, double crochet in the next 25 makes little sense to me. Skip 5 *and slip stitch* then chain 20? 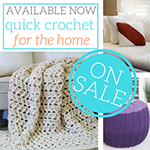 Then double crochet down the chain? Please help me understand this. Hi Autumn! You chain 20, skip the next 5 sts, and then continue dc-ing in the next st. These chains remain unworked in until the next row. They will become the shoulders of the garment, as you’re creating the armhole here. Does that help? Hello hildegard! Thank you! There are definitions and video tutorials for those stitches in the notes, at the beginning of the pattern. I JUSt finished making this sweater in the 18 month size. It is so adorable! I can’t wait to give it to my friend to see it on her daughter. Row 3: With Color B, join to BLO of 3nd st of previous row with a sl st.
Is that the 2nd, or the 3rd? Oh, good catch! That would be the 3rd. I’ll fix that pesky typo now, thanks for letting me know! I made this sweater for my grandbaby following the directions for the 18 month size but it turned out a little snug for her and she is just now going into 18 months size clothes. But it was a very easy pattern to follow and lots of fun to do, I really enjoyed the creativity in the pattern and the seemless end result. So I am going to start another one going up a size or using a larger size needle and see how it turns out. It was a hit with her as well. She is 15 months old and kept hugging it and swaing and saying AHHHH then when I started putting it on she was dancing up and down and could hardly wait! Definately a hit with the little DIVA! Die you Havel any Information, where i can get this in german? I just finished it, and I love it!!! 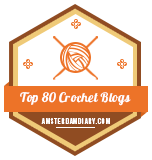 Easy to follow even though I have only been crocheting for two months or so. I made a size 3T for my two year old and did end up adding a few extra rows to the neckline to make it a little less wide. 😀 Glad you like it Cisca! I had finished making the Moroccan Tile Afghan for my daughter and was pondering what to do with the leftover bits of yarn when I stumbled across this pattern! I’m using the scarlet as the main color and using the rest of the colors for the pleats! It’s coming out wonderfully! Thanks for all your hard work. 😀 Awesome! You’re very welcome! Does anyone have a pattern that works well for a matching hat for the Eloise sweater? The Blackberry Salad Striped Baby Bonnet is a popular choice! I may be posting this for the second time and if so, I apologize. 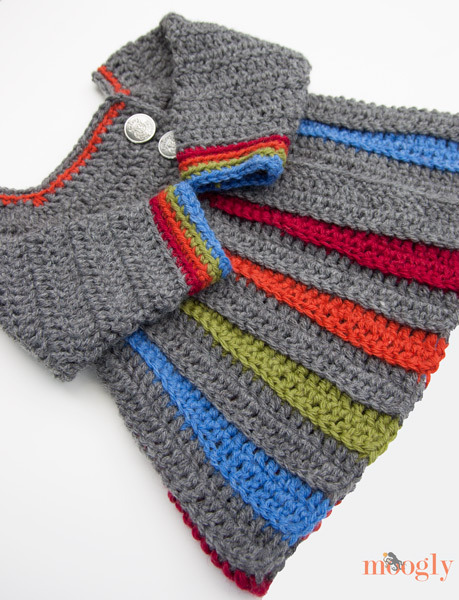 I’d like to make a sleeveless version for a spring/summer baby and am using Bamtastic yarn, which is much thinner. Any suggestions for modifications? I’m thinking go down a hook or 2 and add 1 or 2 stitches to each sc/hdc/dc portion of the pattern? Any thoughts or suggestions? I think that sounds good, plus you’ll likely want to add another repeat for the skirt to make it wider, to make the body big enough around. 🙂 Best of luck! This pattern was so easy to do Tamara! It’s up on Rav for the Ravellenic Games!!! For my youngest granddaughter! Thank you so much for all your work creating great patterns for us to enjoy! 😀 Awesome!! Thank you so much Vaughnde! How do I join to the 1st stitch (the CSDC)? If I just turn the sleeve will be splitted? Hello Claudia! If you could email me a German translation that would be wonderful! I’d add it as a PDF with credit to you, of course. I hope a French translator volunteers – that would be lovely! Thank you Veronique! 1. Yes, the CSDC counts as the first st of the row. 3. No, the ch 2 does not count as a stitch. 5. No, the cuff is left as is. A foundation double crochet stitch always counts as a stitch. If you’re asking about the Chainless Starting Double Crochet, that counts as a stitch as well. Another concern about the Eloise Baby Sweater. I am starting my 2nd sweater and I am running into another issue. I have checked back to previous postings of other followers and I came across posting #165 from Claire on January 5, 2014, regarding Row 3: With Colour B, join to BLO of 3rd stitch of previous row with a Sl st. Claire was wondering if you meant join to BLO of the 2nd stitch or the 3rd stitch and you told her it was the 3rd stitch. If it works better for you to join in the 2nd stitch, then you can do so – it won’t make a significant difference as long as you’re consistent across the sweater. As for the other question, you join to the BLO of that st with the slip stitch, pull it down tight to the yarn, and then slip stitch more loosely in that same stitch to create the start of the stripe. If you find your first slip stitch is so loose it creates a lump there, you can just count that as the first slip stitch. For row 3 of the yolk: do I doc around the chain our across the row under the chain? what a great pattern!! I translated it to german – i love it! where can I send you a photo of my baby sweater? and is there maybe a baby cap which fits to the sweater? Hello Katrin! 😀 Thank you! You can share a photo on the Moogly Facebook page, or you can email it to me at [email protected] if you like! 😀 I don’t have a hat pattern for it yet, but I hope to in the future! 😀 Thank you Fickletickle! I’m so glad you do! Do you think this is too ambitious for a relatively simple crocheter? I can follow patterns and I’m ok, but have never tried something like this. But it is EXQUISITE, and I’d love to make one. Hi Amy! It’s not super easy, but the stitches themselves are not difficult. I think if you take your time and count your stitches, you should be okay! 🙂 Thank you! This is soo cute and I want to make it but I don’t understand english, is possible to translate? I just finished this. I wish I could post the photo. It turned out beautifully. Okay, I’m having a bit of a snafu right at the beginning and I’m probably just being a dork about it. “Row 3: With Color B, join to BLO of 3rd st of previous row with a sl st” – for that part, does previous row mean the row I just finished crocheting (row 2) or the previous row (row 1)? And which side do I start counting from? Hi Kelsey! Previous row means the one just just finished – row 2. 🙂 Count from the right, moving left. I love all your patterns and would like to make this sweater for my grand-daughter. However, the yarn I’d like to use is Bernat Softee Baby #3 Light. I don’t know how to adjust your pattern to fit the gauge…should i use a smaller hook with a larger sized pattern? What do you suggest? To get gauge with a thinner yarn you’ll need to use a larger hook. You could try using a smaller hook and the directions for a larger size, but it’s a bit of a risk as to what size you’ll end up making. Just getting started on the pattern. I’m very excited about it. I am having difficulty with the phrase used in the pattern, “pick up loop of A from Row 2”. Which loop from A…directly under it? Does this website have a picture tutorial describing/showing the how to? Hi Shannon! When you go to work Row 3, you pull up the working loop of Row 2 so that it won’t come undone, and leave it hanging there while making Rows 3-4. Then you reinsert your hook in that working loop to continue on with Color A. Does that help? This dress is gorgeous. Thanks for sharing. I pinned and tweeted. This sweater is gorgeous!! But I don’t crochet. Any chance there might be a knitted version? I think short row knitting could work! I’ll have to ponder that Michelle, thank you! I am having just the hardest time with the top part of the sweater. The skirt worked up so easily and I’ve gotten to row 3 and I cant seem to get the numbers to match up the right way, I get my last 16 dc in, but still have one dc from the previous row unworked. The first time after I double checked my numbers I just kept working the pattern, Every other row worked out perfectly, but the look of having that one stitch not there just bugged the crap out of me so I ripped it all out and started completely over double checking my numbers each step of the way. I still can not for the life of me figure out why I have this one double crochet not worked. Do you have any ideas of how I could fix this problem? I’m going to take a break and then go back and recheck my count again, I’m just super uber frustrated at this point. When working the sleeves, does the ch 2 count as one of the stitches, and when you connect to “first stitch” is that the top of ch 2 or the dc2tg? It’s certainly on the list – it’s always just a matter of timing… thank you! Thank you for this lovely pattern! 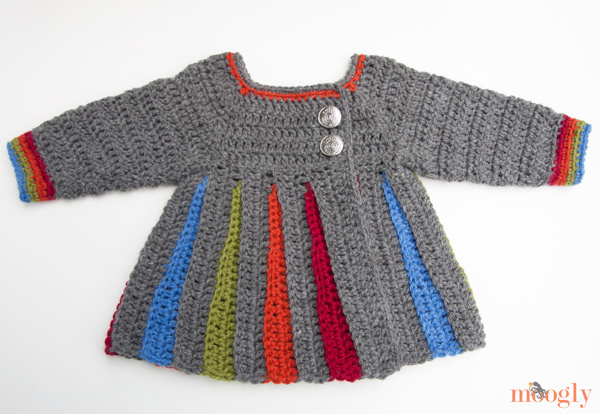 I would like my stitches a bit tighter, and the child I’m making this for is somewhere between 18 mos. and 2T – so if I follow the 2T pattern with a 5.5mm hook, will that solve all my problems? Thanks! So far, so good. Also – if I wanted to do a row of SC along the bottom of the skirt to finish off the sweater, would that mess things up? The 40 chains create the sleeve openings. 🙂 They flap in the wind until the next row, when you work into them. But the pattern says they’re at the end of the row, after the 54– shouldn’t they be at the same spot as the other chains from the previous row? Are you referring to the stitch counts for each row, in parenthesis? I am making the smallest size and I was wondering if the skirt ends on the colored section or do you go onto to another color A section after the 13th colored stripe? Thank you! so that should give you 58 stitches across, not 68… unless I am mistaken? In any case, thanks for your help and for the pattern again! Once again, it’s way too pretty not to make! Or do I just have to add an additional sc every 6 stitch or so (to make it to 68 sc)? Thank you so much for this pattern. I just finished making a size 18 months for my little girl for Christmas, and it is absolutely adorable!!! The pattern was very easy to follow… which made making the sweater so much more enjoyable. Thank you again and keep up the good work! 🙂 Thank you so much Mykhanh! Hello Tamara, I love this pattern and I am so close to finishing it for my daughter for one of her Christmas presents, however I seem to have hit a snag. I’m doing the 3t one and I’m on the first part of the sleeve with the 34 dc worked into the yoke, does the 34 double crochets include the csdc? Or would that be 35? 34 total, including the csdc. 🙂 Thank you Crystal! Super…no words to express dear…. Hi there! This is just beautiful, and I was looking forward to making it for my new baby girl coming soon!! But I have read and re-read the beginning, and started it over again multiple times and can not, for the life of me, figure out why there’s a final st count discrepancy in the beginning rows. There are no noted decreases or increases, yet we go from 27 sts to 25 to 24 back to 27 in the first 5 rows. When I get to row 5, I have no sts left to st in to bring it back to 27. I’m a pretty experienced crocheter, but I have to me missing something! Please help when you get the chance. 🙂 Thanks! Thank you for your response! I haven’t had the chance to get back to it yet, but I should have been more clear. I did everything correctly, as you said, up to row 5. Row 5 is where I run into the problem of coming up with 27 final stitches out of the 24 from row 4. I’m not sure Erin. Have you watched the video tutorial? Please disregard my previous comment. I figured out my issue with row 4. Row 5 remains a problem, BUT if you intended for us to work the first dc into row 2 and the 2nd into the unworked sl st from row 3, THEN I can get the st count up to 27. That would make sense, but is really unclear as written. Is that the intentions? Thanks for your patience with me! I am trying to print out you sweater pattern “ELOISE” – I downloaded the DOC to PFD – but ads and other pics block out some of the directions. What am I doing wrong. 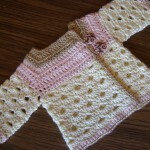 I love this pattern and am making two 3T Eloise baby sweaters simultaneously for the little girls in our family. Completed rows 1 and 2 of the yoke. Row 3 has me confused with where to go after the first dc3tog. Continue underneath the chain stitches, or work into the chain stitches? Can’t find a video on working the yoke or the top down yoke you tube video mentioned in the Eloise baby sweater video. Help please!!! I’m just about done with the sweater that I’ve been working on for the past month, all I have left is sewing in ends, do the edging and sew buttons on…there is a part of me that wants to sew buttons all the way down it. I’m unsure about it though, I don’t know if it would come out right or if it would look right. What do you think Tamara? Have you watched the tutorial video? LOVE this!!! I would love to make this for my 2 year old, but I only knit. Any chance you would consider converting this pattern for knitting? I hope to eventually! 🙂 Thank you! I am sure there isn’t but is there any chance this has a knitting pattern. I saw this pattern and favorited it sometime ago on Ravelry, bought the yarn and just as I sat down to get started realized its crochet! I wanted to make it for a shower two weeks from now and was ready to get going. I can’t believe I overlooked that it wasn’t knit. I guess love overpowered the word. I have no clue how to crochet and I’ve tried so doing this as learning project isn’t really doable. Anyway thanks for any help! Hi Kasey! I’m afraid that there isn’t a knit pattern currently, though I do hope to have one someday! 😀 Thank you so much Lilo! Thank you so much Tammie! After many years, I decided to pick up my crochet hook after seeing this beautiful coat! I wondered if I could tackle it, but your instructions and videos made it so easy! It was fun learning new techniques. Thank you for igniting the flame again! My first granddaughter will be blessed and warm! 😀 Thank you so much Peggy! I’m so glad to hear it. Thank you for sharing this lovely pattern! It came out beautiful will be entering it in our county fair tomorrow then it’s going to my grand-daughter for Christmas. I made the 3T. My daughter is expecting her first baby this June and so I went searching online to find a sweater pattern I thought she would really like for her baby. As soon as I saw this pattern, I KNEW it was the one!!! It’s beautiful!! I’ve learned a lot while making it – I’ve never heard of or done “csdc”, “sdc”, or dc3tog. I am so excited to have learned new stitches! Thank you so much for your excellent tutorial videos, as well – you’re a fantastic teacher! I am at the point of starting the first sleeve and joining Color A with a csdc in the middle of the armpit. My question is: after I yarn over and pull the yarn through, do I do a slip stitch before doing the csdc? Or just start the csdc right away? Also, it’s a little late now, but for future reference: I don’t know if I properly “broke off” each individual color in the skirt. I, literally, did the last slip stitch at the end of the second row of the color I was working with and then pulled up the loop and cut it. Is that correct? Or, was I supposed to “break” it by first pulling another slip stitch through that loop – creating a sort of knot, if you will? (Hope that makes sense). Hi Sue – and congratulations!! 😀 And thank you so much! Thank you so much for this pattern. I have made it for my daughter and even though I am a beginner I found it very easy to follow. An absolute success that gives me confidence to keep the hook going. Thanks again for offering it for free. You are so very welcome Steph, thank you! I hope so – it’s a tough one to upsize. Thank you! This is one of the most adorable patterns I’ve seen! ❤️ I would wear it! Thank you for sharing. Thank you so much! 😀 I’ve been pondering an adult version for some time, but just can’t settle on a flattering line for the “pleats” to start at! Babies look cute no matter what, much easier lol. Hi Ruby! NOTE: For 6mths there will be 13 color stripes, for 12mths there will be 14 color stripes, for 18mths there will be 15 color stripes, for 2T there will be 16 color stripes, and for 3T there will be 17 color stripes. B I love this sweater so much…. I’ve made 2-3 of them and put my own spin on them…generally just in edging or something . 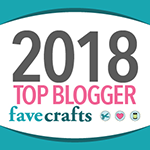 ALSO, I really appreciate your response to comment #201 – it’s very encouraging for a newer crochet-enthusiest to ‘step out’ & make patterns ‘their own’, so to speak. Because it DOESN’T matter which stitch you start the color strips in. GREAT pattern – writing for a little bit more confusing pattern because of the insets. Having trouble with row 2 on the yoke. I did the DC, skip and chain. Then it says to turn and DC 66 and chain 44. Is this chain left dangling or do I attach it with a slip stitch at the end of the row. Help! I liked it so much that I had to try it. I watched the video which I thought it was the whole thing. manage to make one nicely. Again I love it and thank you for sharing. You are a great designer. 6 months!!! oh my but you are right it was so worth it. It was so easy to follow and the design is unique. Made It two years ago for my Gr-niece and it was oohed and awed by everyone at the baby shower. Hope you are OK, I am so thankful to you for this pattern. I made this in two years old size for my niece, I used baby pink with deep pink stripes and it looked wonderful. You really made it easy for everyone. Hello Humaira! Thank you, I’m so glad you enjoyed it! Hi, I just made this. It’s adorable. But I think I have a stupid question. I’ve finished it but don’t see any sewing instructions to convert it to a sweater from a wrap over cardigan… Do I sew it together to create a sweater or add hooks/eyes, or press studs? Hello Tamara, tried this design..came out perfectly !!! Thanks for this beautiful cardigan..its really easy one to make !looking forward for more designs!! Just finished making this for my three year old and it’s perfect. I have yarn left over though and am wondering you can recommend a hat or mittens pattern that would go well with this? Thank you so much Fatma, I’m so glad you enjoyed the pattern! You can find two matching hats to choose from! Hi there! I’m working on the 0-6 months sweater and it’s coming along awesome! Just a quick question : if wanting to make a size smaller (newborn), with ww yarn, do you have a hook size recommendation? I was thinking or going down a full size, but not sure if it would be enough. Thanks for the sweet pattern! I have a question on the pattern. On the FDC. Is the chain 3 to start, is this to be counted as one of the stitches? Hi Ronda! The chains at the beginning of a row of FDC are not usually counted as a stitch.